Lights along roads can cost quite a bit of money so why not use glow-in-the-dark road markings? Part of that vision included weather markings — snowdrops, for instance, would appear when the temperature reached a certain level. For now though, the 500m stretch of the N329 highway in Oss features only the glow-in-the-dark road markings, created using a photo-luminescent powder integrated into the road paint, developed in conjunction with road construction company Heijmans. Roosegaarde told Wired.co.uk Heijmans had managed to take its luminescence to the extreme — “it’s almost radioactive”, said Roosegaarde. You can get some sense of that in this embedded tweet, which appears to show three stripes of varying shades of radioactive green along both the highway’s edges. Sounds pretty interesting, particularly if the markings can last long-term. I suggested something like this a few months ago to combat the issue of snow covering lines in parking lots. A sample of photographer Alex MacLean’s aerial photography includes this picture of a highway intersection in Albuquerque. 1. The interplay of light and dark both from the sunlight as well as the darker roadway and the lighter desert. 2. The modernist twists of the highway ramps. 3. The smallness of the cars, a reminder of the limited lives we lead. I know highways are concrete entities that lead to traffic and air pollution but I’ve always enjoyed seeing them from above. In the Mayor’s attempt to turn the Chicago Riverwalk into Times Square Jr. or Hong Kong Lite, the city may soon be installing some new lights. A lot of lights. The Mayor wants to boost tourism in the city by 10 percent, or attract 55 million annual visitors by 2020 and thinks that adding a light show to the city would be the key. The lights are intended to highlight Chicago’s architecture and skyline, but also to open up tourists’ wallets by extending the day into night. This “bright” initiative, headed up by the president of Broadway In Chicago, will start with an international call for submissions. Plans show that the lights won’t only be noticeable in the loop, as the Mayor’s vision is to expand the project into the neighborhoods. Perhaps some think Chicago’s world famous architecture can’t speak for itself. “It will make nighttime in Chicago an experience unto itself. 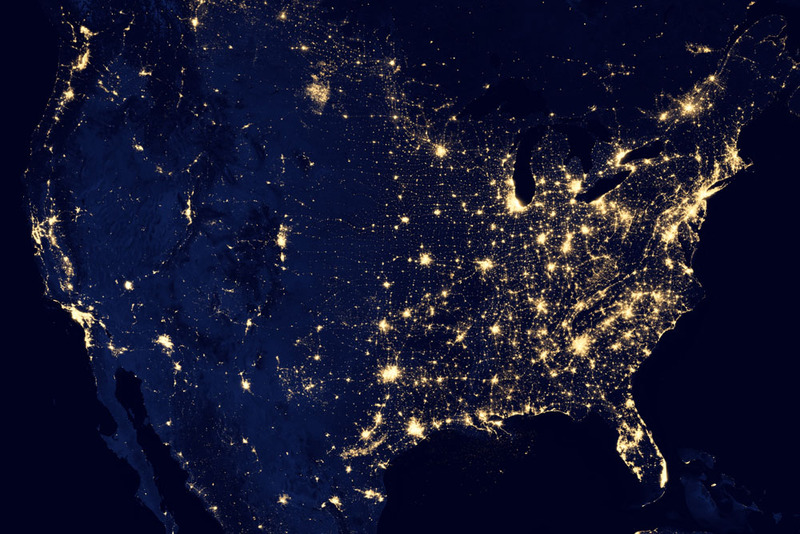 It will make us North America’s city of lights. People will come from far and wide to see what we’ve done and enjoy our city,” Emanuel told a clout-heavy audience at the Museum of Science and Industry.The light-up Chicago initiative is being spearheaded by Lou Raizin, president of Broadway in Chicago. If artists, architects and engineers “work together as teams,” Raizin said he’s certain they will find ways to use Chicago’s world-renowned architecture, the city’s iconic bridges, Lower Wacker and the river itself as a “canvas” to “imagine lighting in a unique and different” way. “It’s about creating a spectacle that winds up allowing us to be sensitive to the assets that we have, but making a pivot that takes the old guard to the vanguard. It’s not just washing a building with light. It’s about creating theater. It’s about engaging. It’s not just color. It’s three-dimensional. It’s really creating events in light,” Raizin said. These super-high-resolution images, made possible by a new type of infrared sensor on the satellite, were revealed here at the American Geophysical Union conference Dec. 5. The Visible Infrared Imaging Radiometer Suite has a “day-night band” that can detect natural and man-made light with unprecedented resolution and clarity. It can resolve everything from the nocturnal glow of the atmosphere to the light of a single boat at sea. It can detect auroras, wildfires, the reflection of moon and star light off clouds and ice and the lights alongside highways. The sensor has six times better spatial resolution and 250 times better resolution of lighting levels than anything that came before it. The VIIRS instrument works by scanning in 22 different wavelength bands. For each pixel, it uses a low-, medium- or high-gain mode to accurately depict the light from each source. Low-light signals are amplified and bright lights are kept from being over-saturated. The fate of Detroit has been in the news in recent years and here is another symbol of the city’s troubles: it is considering taking out a number of its streetlights. Delivering services to a thinly spread population is expensive. Some 20 neighborhoods, each a square mile or more, are only 10 to 15 percent occupied, said John Mogk, a law professor at Wayne State University who specializes in urban law and policy. He said the city can’t force residents to move, and it’s almost impossible under Michigan law for the city to seize properties for development. This sounds similar to the story from late last year where Detroit suburb Highland Park also decided to reduce its number of streetlights to save money. Here is my question: does the story stop with streetlights or is the turning off of streetlights just the first step in much bigger efforts to contract Detroit? If you were a politician, perhaps dealing first with streetlights eases people into larger steps of consolidating and/or reducing services. Turning off streetlights is not a small thing; people tend to equate them with safety. Once streetlights are reduced, what comes next? This story reminds me of an argument in Barrington Hills in late 2010 about reducing the number of lights to preserve the community’s rural, wealthy character. So wealthier, higher-class areas want fewer lights while cities and denser areas see street lights as a basic building block of city services? On one hand, it seems like a silly fight: people in Barrington Hills, Illinois, a wealthy community known for its large lots and wealthy residents, are battling over a proposed ordinance that would limit outdoor lighting. On the other hand, this debate appears to be about much more than just outdoor lights: it is a discussion about whether Barrington Hills can retain its character or whether it will slowly just become another suburb. Barrington Hills has kept a worried eye on the encroaching masses from the time of its incorporation in 1957. A local history says the village was conceived of in the locker room of the Barrington Hills Country Club by men who vowed to prevent their estates and gentlemen’s farms from being sliced into tract housing. The village set its zoning code so that properties must be a minimum of 5 acres, a trait it has kept despite booming development in the surrounding communities of Algonquin, Barrington and Carpentersville. Even South Barrington, a town with traditionally large lot sizes, had to allow a subdivision in order to settle a lawsuit. But Barrington Hills got a glimpse of an unhappy future a decade ago when a developer sought permission to build hundreds of homes in the village’s northwest corner. Turned down by the trustees, he sued and won the right to de-annex the land (to date, though, nothing has been built). The defeat has lingered in the minds of some village leaders, and some say it plays a role in the lighting feud. That had been a longstanding concern in the community, Knoop said, and the Village Board approved the plan without controversy. The trouble started when some trustees tried turning light control into law. So this debate places two values in opposition: the ability of suburban homeowners to light their home as they wish versus the ability of the community to control its own destiny. Both of these are powerful forces: many people move to suburbs, and particularly exclusive suburbs like Barrington Hills, so that they don’t have people telling them what to do. But at the same time, people move to places like Barrington Hills because it doesn’t have sprawling subdivisions and busy roads. In my mind, there is little surprise that some small issue could become such a big debate: it is not about the lights but rather about whether Barrington Hills can retain its character against the pressures that threaten to turn it into just another suburb. Such debates are relatively common in many suburbs as both political officials and residents consider how proposed changes to laws, zoning, and development patterns might alter the feel of the community. In this particular community, we could ask: why did this discussion develop around outdoor lights instead of another issue or is this a long-running (yet punctuated) debate that the community has been having for decades?